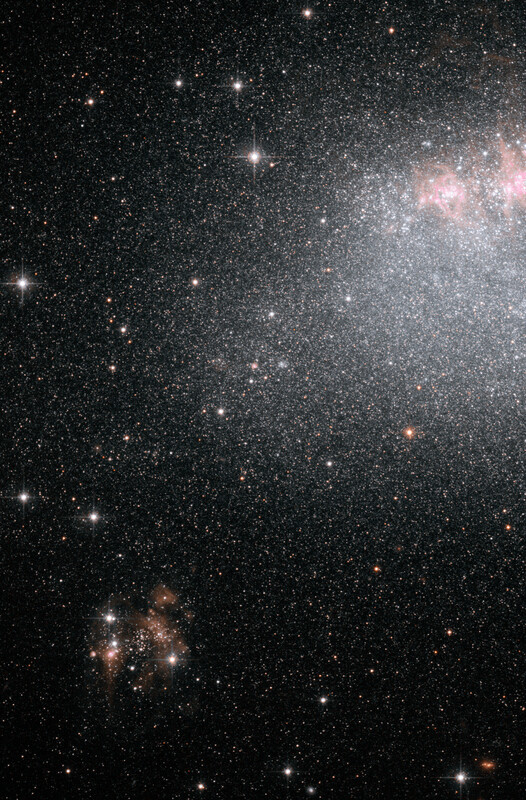 This image, taken by the NASA/ESA Hubble Space Telescope, shows myriad stars residing in the central regions of the dwarf galaxy IC 4662. The bluish dots are younger stars; the reddish dots, older stars. The irregularly shaped red blobs are in regions of current starburst activity. One such region extends off the image's top, right edge. IC 4662, located 8 million light years away in the Pavo constellation, is part of a Hubble study of starbursts in nearby, small, or dwarf, galaxies. Based on this study, astronomers have found that starbursts continue 100 times longer than first thought, lasting 200 million to 400 million years. These galaxies show that starbursts are not isolated events, but sweep across a galaxy. Position (Dec): -64° 38' 56.78"